Brewer's notes: Dunc and Sam pulled from their winemaking contacts to secure premium, seasoned Pinot Noir puncheons to put this brew together. 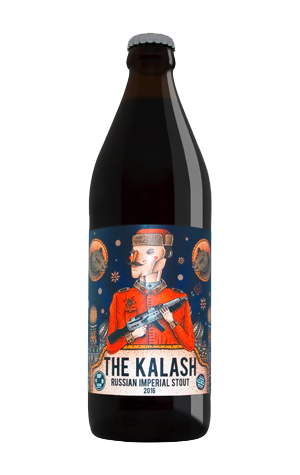 After six months ageing in French barrels, this aggressive Ruski, named after the notorious Kalashnikov rifle and weighing in at a heavy 10.2 percent alcohol, takes no prisoners and asks no surrender. This rich, brewding beast will take you to the dark side. Barrel-aged in 500 litre oak puncheons, the subtle oak influence integrates with chocolate, tar and spice. The Kalash was dry hopped with Amarillo and Cascade hops.